Vinyl-coated 1/8" cable is corrosive-resistant and built to last for years. When not in use, unit self-recoils. 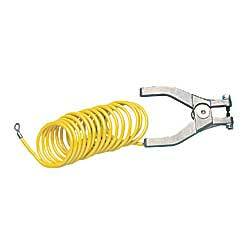 Clamp is heavy-duty and designed like a plier. 10' long. IN STOCK. Prevent liquids from splashing. Use these funnels with standard drums as well as small jugs and bottles. Designed for use indoors or out. Resist chemicals and corrosion. 16"H. 10-1/2" diameter. IN STOCK.